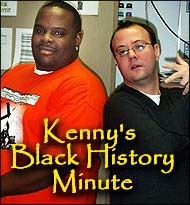 February is Black History Month, and Murray in the Morning is observing the occasion! Kenny Edmonds (pictured above to the left of T.J.) -- who you may remember as JB's understudy -- will be your guide. If you miss any of Kenny's educational reports, catch a replay of them on this page.